Looking for a holiday cookie recipe that's delicious but on the lighter side? Reach for these yummy Fat Free Gingerbread Cookies from Munchin with Munchkin. They're full of tasty goodness like candied ginger and chai spice but leave out the butter! They're so good you'll never know the fat is missing. Shh, we won't tell if you won't. Sift together flour, baking soda, salt and spices. Set aside. In a large bowl combine brown sugar, molasses, apple sauce, vanilla extract, maple extract, chai concentrate. Beat with an electric mixer for about four minutes, until smooth. Add egg whites and beat for another minute until well combined. Preheat oven to 350. Line a cookie sheet with parchment paper, or grease with cooking spray. Combine granulated sugar with cinnamon in a shallow bowl. Scoop one tablespoon of cookie dough and place in the shallow bowl. 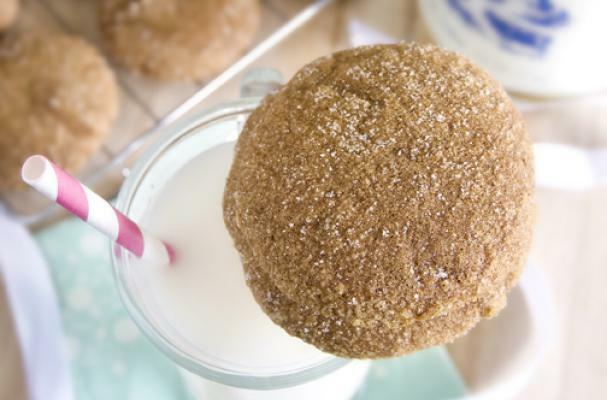 Using your hands, coat the dough with the cinnamon sugar and shape into balls. Place cookie dough on prepared cookie sheet leaving about 3 inches between each cookie. Bake for 10-12 minutes. Remove from oven and transfer to a rack to cool.